It is always a cruel injustice when a talent is cut off at the moment when recognition and repayment for all the hardship years would be just around the corner. This is what happened to William Busch just six months before the end of the War. As John Amis says in his programme "Forgotten Reputations" for BBC Radio 3 "Of all the musicians of the �30s and �40s � William Busch is the most likely to be forgotten." William was born in 1901 in England of German parents. They had settled in North London after spending several years in South Africa as William�s father was in the diamond trade having an office in Hatton Garden. In 1915 he travelled to New York to study. He attended Riverdale Country School and Columbia School. It was Mr Franz Woodmansee, his piano teacher in America, who suggested that William should study also harmony and composition, so in January 1920 he started harmony lessons with Mr A.W. Lilienthal, a former violin player with the Philharmonic Orchestra. William found harmony rather tedious at first, always putting it off until the last moment before completing his homework! After five years in New York his father insisted that he returned to Europe, so in October 1921 William arrived in Berlin with a letter of introduction from Dr Guils Bagier to Leonid Kreutzer who took William on as a pupil outside the Hochschule. William greatly enjoyed observing lessons at the Hochschule, listening to concerts and practising hard. Kreutzer suggested that he should study harmony with Herr Leichentritt. He took a while to settle into the different methods of teaching from each of his teachers, but once into their methodology, he felt safe and secure. William�s father was still complaining again about the amount of money it was costing him for William�s fees and accommodation in Germany, so after three years in Berlin William finally came back to continue his studies in England. He decided he would ask Moiseiwitsch and Backhaus. William had met Benno Moiseiwitsch during one of the many journeys between New York and London. William found Benno�s musicality confusing, sometimes he played beautifully "He has an admirable technique, though his moods do not always suit the compositions." He had met Wilhelm Backhaus at his aunt, Sophie Wagner�s house, who held many Bohemian parties with musicians and artists. She being an artist in her own right, of colourful paintings of flowers, several being shown in the Royal Academy of Art. Unfortunately Backhaus was too busy to take pupils, but gave him various exercises and pointers. William approached Moiseiwitsch for piano lessons, which unfortunately were few and far between because of commitments, however he put William in touch with Miss Mabel Lander who became his piano tutor and life-long friend. There was a fortunate meeting here though due to a mistake on Moiseiwitsch�s part, he booked both William Busch and Alan Bush in for a lesson at the same time; they met, and became firm friends. This friendship was to prove very advantageous. It was during the year of 1926 that his friendship with Alan Bush flourished. Together they attended concerts as well as visiting each other�s homes, enjoying listening to music and having long discussions on politics, philosophy and healing. William wanted to start composing again; the several attempts he had made ended up in the bin whereas Alan was already composing and having his music performed. William went to hear Bush�s String Quartet at the Contemporary Music Club in Queen�s Street played by the Kutcher Quartet and this spurred him on towards his own composition. Miss Lander wanted William to play the Chopin Fantasia in a recital at the Wigmore Hall; here at last was a public concert to work towards, something he really needed and wanted. He also decided to ask Alan Bush to give him some lessons in composition, as although they were similar in age, Alan had been composing for quite a while, but William needed the stimulation and confidence to start again. At last the day of the concert arrived, the first William had performed in front of a critical audience. He felt he played well, though in typical William style he has to throw in "�it might have gone better, but it went quite as well as I had really expected �I received four recalls." He was beginning to work hard at composition. So he was thrilled to receive a telephone call from Miss Barron, Secretary of the Faculty of Arts, saying that his two short compositions Two Pieces for Wind Instruments had been accepted for performance at the Composers concert and stood top of the list, which Arthur Bliss judged. The first rehearsal of his first composition proved to be rather a disaster. The second rehearsal went much better. Alan had offered to conduct the piece and on May 24th 1927 at the Faculty of Art, his first composition was performed. Spurred on with this good news he started to work hard on the promotional side of his career. He arranged a meeting with Philip Ashbrooke who organised concerts at the Aeolian and Grotrian Halls, and a date was booked for William to give his first London Debut on October 20th 1927. So work in earnest had to begin. Work came in slowly, certainly not fast enough to create much of a living. His father was critical of his progress not really understanding the concept of how much work and practice needed to be done. It was in June of that year that William was introduced to Mr Clements who was Secretary of the Finchley Chamber Concerts. He began to play duets and trios with him and various friends. Finally much to William�s joy Mr Clements invited him to play the César Franck Prelude, Chorus and Fugue and several other pieces at the Chamber concert on October 4th 1927. On October 15th he played to John Ireland at his South Kensington Studio, the pieces he was going to play at his first piano recital at the Grotrian Hall. William was thrilled with Ireland�s response. "He said my interpretations were not very different from his own and he gave me various pointers on them. He was very nice; played me a new unfinished work� and said of his own accord that he would like to have me as a pupil in composition!" At last William was beginning to infiltrate into the musical world of London in 1927. The day of his first solo recital dawned on Thursday October 20th � "Today I made my London Debut�well, it was not a failure, thank goodness. It was, perhaps a success." William never allowed himself to revel in success, it was always tempered with a �perhaps� or �I could have done better.� "The Beethoven Bagatelle went quite well for a beginning, the César Franck was the least satisfactory. The Fugue part was muddled in a good many places unfortunately. But the modern group of Bax and Ireland (Hill Tune and Country Tune of Bax, Prelude in E flat, April, Towing Path and Bergomask) went much better and the Brahms group perhaps best of all. What pleased me best of all was that John Ireland himself came around and seemed really pleased with the way his pieces went. Most of the people seemed to like it." 1928 was a year full of promise. Mr Clements offered William a recital at the South Place Concert at the City of London School and to become the resident pianist for the South Place Ethical Society at Conway Hall and William�s next London recital was on March 21st again at the Grotrian Hall. His father, finally realising that William was serious in his ambition to become a concert pianist, bought him a beautiful Blackwood secondhand Bluthner "�it had a soft mellow tone, not brilliant, but very lovely" to replace the worn out Lipp (no. 288422) that had withstood the tremendous amount of practice. He was practising hard for his second London recital where he played a Schubert Impromptu Opus 142 and Sonata, Brahms Variations Opus 21 and the Rhapsody in E flat together with a modern group by Moeran, Ireland and Bush. He was thrilled to have Moeran himself come backstage and congratulate him on playing his pieces so beautifully. The critics next day were fairly complimentary. Francis Toye in the Morning Post giving a �good� account as well as in the Times and a �fairly good� one in the Telegraph. His third concert on November 9th was with John Ireland and Evelyn Arden. The next day he eagerly scanned the newspapers and even though it was mostly about John Ireland the Telegraph said "�an able and sympathetic interpreter with a high level of technical achievement�." With more performances his musical career began to expand. He accompanied Evelyn Arden and continued playing for the South Place at Conway Hall as well as the Faculty of Art, the 1927 Music Club and the Contemporary Music Club. This combined with six hours of practice and many visit to concerts, theatres and films didn�t leave much time for composition. His composition lessons continued with John Ireland, though sometimes their personalities clashed as Ireland felt that William would benefit by leaving home. William was trying to maintain a good relationship with his father who was paying most of the bills. "Had a row with Father last night, strong and dominating personality as he is, I don�t see why I should feebly swallow all criticism of his and tremble in fear of him�I must strive harder and harder to earn my own living." It was very difficult for William to leave a very comfortable home but it was also very difficult to earn any reasonable money from music. His performances at �At Homes�, The Faculty of Arts and elsewhere didn�t generate any income. His recitals perhaps generated a small income but two or three a year was not enough to live on. He was working on his composition but to get anything published required months of work and the ability to �network�, which was not one of William�s strengths. Many times William�s father suggested that he joined the business with his brother Richard, but William stubbornly refused to relinquish his dedication to music for the sake of money, so an uneasy truce was maintained. 1929 sees William working hard on his Variations that he performed for the first time in March. The reception was lukewarm, the Times giving it quite a damning critique which upset William so that he wrote a letter stating "�unfavourable criticism is legitimate of course but at least an intelligent explanation can be offered�" He later played them at an �anonymous� concert at the Faculty of Arts where the reception was more promising "�the effect was most encouraging, for several people (among them critics and composers) made very complementary remarks. If people �feel� the work, that is perhaps the most that I can expect and hope for." In April of that year he travelled back to Berlin to give his first recital at the Scheuechten Saal. He met up with Kreutzer who he found pessimistic and full of woe as to the future of Germany and also Hugo Leichtentritt who was especially impressed with his Theme Variations and Fugue. He played the Schubert Impromptu Opus 142, Theme and Variations, the D minor op.34 No.2 Sonata of Beethoven, a modern group, Ireland�s Sonatina (1st Berlin performance), Bax�s Hill Song and Apple Blossom Time, his own Theme, Variations and Fugue and then a group of Brahms Intermezzi and the Capriccio in D minor. The critics in Germany were very complimentary, especially in the Borsen-Zeitung which pleased William greatly. It was a very slow process to get work. Several recitals in London and one in Berlin was not a guarantee of a full hall and agents were difficult to impress. He played the piano part of Herbert Bedford�s ballet music �Peribanon� together with Malipiero�s �Grotteses�, which was being performed at the Faculty of Arts with Angel Grande. This was his first meeting with Angel, who proved to be a good friend and worked extremely hard to give him work. He also began working for the BBC, a concert tour of New York was in prospect for February next year and another tour to Berlin was on the cards, so at last he was beginning to feel more independent. He produced a brochure containing his notes on modern music and critiques of his recitals, as self-promotion was the only was forward. He was very keen to promote modern music. 1930 started off on a very promising footing, the friendship with Angel Grande was proving to be very fruitful. The prospect of a tour of South America, one in Spain and the playing of a modern concerto with Grande�s orchestra at the Wigmore Hall were all on the cards. The South Place Ethical Society concerts were now a regular feature and people were approaching him for his accompaniment. Although he was extremely flattered, he still had his prime goal as a solo concert pianist and was fearful of being side tracked from his absolute ambition. The tour of America in February of 1931 was very successful, ending up in New York. He was delighted to receive good notices and his American Agent was anxious for him to return the following year. On returning to England, he was anxious to get back into composition as the Spanish Tour with Angel Grande was fading away due to the political situation. He continued to attend meetings at the Faculty of Arts and enjoying evenings with his friend May Mukle where he first meet Rebecca Clark who engaged him in long conversations on music and composition, and who dedicating �Cortège� one of her pieces to him. Even though he was beginning to get extremely busy he was beginning to question as to whether he was really cut out to be a first class pianist, "�very busy day, but by no means satisfactory. This morning attended a rehearsal at the Faculty of Arts for the Bedford �Divertimento for Piano & Strings. Then played two movements of the Beethoven Sonata op.2 No.2 at Conway Hall. This evening played with Grande at the South Place Concerts, the Beethoven �Kreutzer� Sonata and Mozart�s Bb and Spanish solos. Through nervousness and very inadequate technique the Kreutzer suffered considerably. The Mozart went better. What can I do about it? Do I want to remain a limited and second-rate pianist?" He couldn�t shake off his depression about his playing, the nervousness that permeated into his muscles made it difficult to move his fingers. He decided that as composition had taken rather a back seat over the last couple of years he would start again. He still continued with his playing having a few lessons from Egon Petri trying to improve his technique, which he always felt was lacking. He was introduced to Bernard Van Dieren who had expressed admiration for his Variations and this subsequently led to William starting lessons for composition again. Composition began to excite him again with Van Dieren bringing him face to face with how little he knew about ear training and improvisation together with the ability to think in various parts. These lesson were a constant source of inspiration to William. It was this year that he first met Gerald Finzi, through Howard Ferguson, and they hit it off immediately with William playing his Variations and Gerald liking them. He would visit Gerald in his little house in Caroline Street where they played their compositions to each other. William liked his works"�most of them bear traces of �pastoral� influences, so often exposed in English Music (from Vaughan Williams downwards) but they are much superior to the ordinary type�." Throughout July 1931 he was working hard on the Mozart Bb concerto (K456), practising with Mabel Lander, Charles Proctor, May Mukle and Rebecca Clark as he was to play it on July 20th with the Bournemouth Municipal Orchestra under Sir Dan Godfrey. The concert was broadcast on the BBC and William was pleased with the outcome "�three recalls�" On August 30th 1931 he again did a recording for the BBC where he played two Mendelssohn �Songs without Words�, Haydn F minor Variations, a new piece by Rebecca Clarke and his own Gigue amongst others. He was still dogged with frustration at his inability to get down to serious composing, he had a burning desire to write some truly fine valuable music, which no doubt he would have achieved if he hadn�t died so young. The small amount that he did produce was improving all the time as he was gaining confidence in his own ability to write good original composition. Gerald Finzi was very enthusiastic and encouraging, eager for William to progress in his work "�he thinks that I should have the character to carry out what he believes is real work of value�I can do it!" With his composition and piano technique improving he began to relax, opening himself out from the constant condemnation of his inability to master his own tough self-criticism. This might have been due to the fact that he met �Babs Taylor�, who in 1935 became his wife. However, before their marriage he had to prove to his father that he was able to �keep� his wife. Panic set in as he almost gave up his music to go into the business. Composition was thrown into the background as he threshed around trying to think of ways he could earn a regular income. He played again for Sir Dan Godfrey and the BBC as well as practising for his solo concert at the Wigmore Hall on October 6th, 1933. He also took on piano pupils, but eventually the situation was eased as Sheila (Babs) began working as a diamond dealer in his father�s business and finally they were married on June 1st 1935. The prospect of marital harmony seemed to settle William as at last he could put his mind to composition. He took his songs, Sweet Content, Rest, Harvest Moon and The Fairies to the blind singer Sinclair Logan, whom he had begun to accompany at Conway Hall. He liked them very much and on the strength of their friendship they decided to collaborate, feeling that together they would create more interest in William�s songs. Sinclair wrote after his death, "The Song-Cycle �There have been Happy Days�� should rank with the large-scale works because of its masterly design and its significant character. The work is complex yet stark in its clear-cut conciseness and is the complete expression of Busch�s philosophy of life. It is in fact in his songs that Busch is most original and it is not yet generally realised that he actually wrote a new page in the history of Song." The continued problem of finding a publisher to take on his work never ceased to cause anxiety. He approached Hubert Foss of the Oxford University Press, but as always there was a slight note of caution. Though he liked the songs and the Piano Variations he only kept them for "further consideration". This was a constant source of irritation for William, but because of his good nature he never pushed or �networked� himself. He would help anyone else to gain recognition, but when it came to pushing himself into the limelight he always held back, continually berating himself for his non-productivity. He had regular work at Conway Hall, several piano pupils and his reputation as an accompanist was growing. He began to realise that in actuality he didn�t have the right temperament to become a concert pianist, he had the dedication but nerves and self-consciousness affected his muscles. He felt it was time to devote more time to composition and now with a new wife and a house with a beautiful music room there was nothing to hold him back. He started work on two compositions "one is orchestral, the other is for violin and piano � the former seems the more weighty of the two". This was his Piano Concerto. He didn�t find composing easy, his compulsive self examination and criticism made every bar composed a torture. He struggled until John Hunt looked over the work and enthusiastically encouraged William to continue, later Alan Bush and Bernard Stevens and then Gerald Finzi did the same. All through 1937 he struggled hard sometimes in despair at his inability to find his muse contrasted with periods of sheer exhilaration when the muse was found, until finally in December the concerto was finished. Alongside this he was working on Ode to Autumn which he later arranged for string quartet, and a short piano piece Intermezzo. Margaret Ablethorpe and John Hunt played his Theme, Variations and Fugue for the BBC and at the Aeolian Hall respectively. The Prelude for Orchestra was composed in this year, which he showed to Angel Grande who wanted it transposed for strings where it was played at the Aeolian Hall on December 3rd 1937. 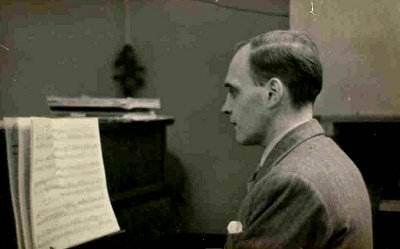 The following year William and Howard Ferguson gave a double piano performance of the Piano Concerto at Mabel Lander�s studio on October 27th 1938 which Vaughan Williams, Bliss, Edmund Rubbra, Calvocoressi, Elizabeth Maconchy, Alan Bush, Sophie Wyss, John Hunt, Norman Fraser and many more attended. Gerald Finzi turned for William. He was thrilled to get a letter from Vaughan Williams saying how much he had enjoyed the concerto, and that he hoped to hear it soon with orchestra as it was "masterly". On the strength of this one performance he received a contract from the BBC to play his own concerto on Friday 6th Jan 1939 with Sir Adrian Boult conducting "I am so thrilled and excited!" he writes in his diary. In actuality it was performed by William with the BBC Concert Orchestra conducted by Clarence Raybould. After this excitement William settled down to work on the Piano Quartet, several songs and a "sort of Passacaglia for Violin and Viola, four bar theme and seven variations so far." He played these to Gerald Finzi whose reaction was enthusiastic. "I felt greatly �bucked� because his opinion is really honest and candid. He is such a dear chap and I like him among the best of my friends." The impending war hung heavily over William, particularly as Sheila was expecting their first child. He couldn�t focus his mind on work. Their doctor suggested that they move out of London so a trunk was packed as a precautionary measure. On September 1st 1939 came the news that Germany had invaded Poland so William and Sheila regretfully left their home in Linden Lea, Hampstead and travelled to Thatcham where Anthony and Ruth Scott had offered sanctuary. Then on to Ashmansworth to the Finzi�s and eventually to Woolacombe where they stayed for the duration of the war. A long and sad period was about to start. They rented a small house in Woolacombe, �Greenbanks� which became a constant haven for many of his friends in London. He immediately became a loyal member of the Peace Pledge Union in Barnstaple run by the local grocer Mr Thornton "It is among these people that the strength of pacifism should lie." On November 4th 1939 William was ecstatic to finally become a father. Sheila gave birth at 10.55 to a 6�lb healthy boy. The days now became pleasantly similar with a routine of work, Sheila and Nicholas, reading and then at 9.00 o�clock the news with its unreal and terrible tales of killing. He was approached by Mr Cowler to play piano for his folk dance group which he enjoyed except in winter when it was so cold that his fingers froze. William felt very cut off from the musical scene. He was always hungry for news and was thrilled to receive a letter from Effie Hunt asking for copies of the Ode to Autumn and Passacaglia for the reading committee of the L.C.M.C for a concert on April 9th 1940. The Ode was performed by Betty Bannerman and Harry Blech. Whenever William managed to travel to London, the days were filled with rushing around meeting friends, going to concerts, trying to get publishers interested in his music; the war was having a dire effect on the interest in contemporary music. The Piano Quartet was first broadcast by the BBC on July 12th from Wood Norton with William playing the piano. As the war deepened the question of "call up" was imminent. Mr Thornton of the PPU offered to incorporate William into his business, but William couldn�t see himself as a grocer. A letter from Edmund Rubbra boosted his moral "don�t let the war get you down, go on writing � it is the only way to keep one�s perspective." This bolstered William and by the end of that year he had written three movements of his Cello Concerto for Florence Hooton who had requested he write one for her. On August 1st 1941 the letter he had been dreading arrived. He was summoned to appear before the Tribunal for Conscientious Objectors at Bristol on Thursday 7th August � only seven days to organise his defence. His brother-in-law attested for him, Norman Fraser wrote a letter to justify his occupation as a composer and he took several cuttings from the Radio Times with career particulars. Judge Wethered seemed impressed and to William's relief and amazement he was let off to continue composing his cello concerto. On returning home he joined the Woolacombe Fire Service and was asked to organise a concert in aid of Stirrup Pumps! With the Tribunal behind him, he felt he couldn�t slack for a moment in composition and by the end of August he had orchestrated the first and second movements. 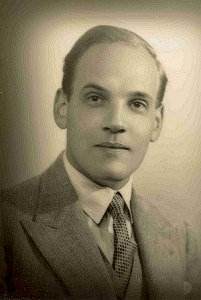 He sent the score to Julian Herbage at the BBC only to get a rejection but Florence Hooton rang to say that O�Donnell of Oxbridge RAF Orchestra wanted to hear it. 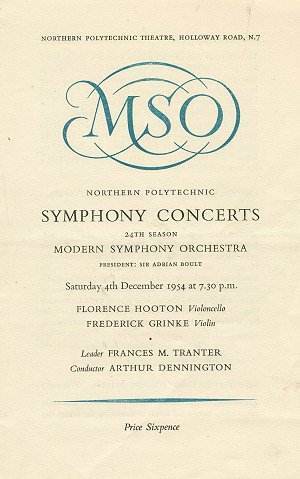 So the first performance of the Cello Concerto was by the RAF with Florence as soloist on December 18th 1941. The second playing, also with Florence Hooton, was with the BBC under Sir Adrian Boult, who was very complimentary about the piece. Edric Cundell of the Guildhall School of Music was very impressed saying it was �real music�. Henry Cummings asked him to write a song for a recital he was to give and William managed to produce The Centurion in two days! David Martin and Max Gilbert played his Passacaglia and he took the opportunity to meet Michael Tippett again. They had met several times and corresponded regularly. Tippett had lent him his �Concerto for Double String Orchestra� as they often exchanged compositions; Michael especially liked the piano quartet and the songs. 1942 was a difficult year with spasmodic periods of composition. He was re-scoring the cello concerto and working a new piano piece which was the Nicholas Variations inspired by his beloved son, but the war conditions weighed heavily on William "I feel my days are empty at present, empty of real work � composition." At this time his health also began to worry him with bouts of jaundice and stomach trouble, the doctors diagnosing gall bladder trouble. He began working on a Capriccio for cello which he immediately sent to Florence Hooton, Memory for cello and piano, "a peaceful piece, I thought of looking into Nicholas�s room as he slept" The Elegy, Nocturne and Capriccio were broadcast in Feb 1943. He played the Nicholas Variations before Horace Dann, Ronald Briggs and Lennox Berkeley "and to this somewhat overpowering collection of BBC officials I played the work�they seemed interested enough." Also Sir Henry Wood requested a copy of his cello concerto. 1943 was a very productive year, William worked hard on many songs requested by Henry Cummings and Peter Pears, violin and cello pieces for David Martin and Florence Hooton, then on August 13th his cello concerto was played at the Albert Hall Proms under Sir Adrian Boult. "� The Albert Hall was full to overflowing�it was thrilling to feel that my work was going to be played, especially when Sir Adrian Boult and Florence Hooton came out on to the platform�." People were beginning to perform his music, Ilona Kabos was to play the Theme Variation and Fugue on a broadcast by the BBC where Henry Cummings also sang seven of William�s songs and Tom Bromley played the Nicholas Variations. At last he was becoming known as a composer in his own right. Elizabeth Poston of the BBC was always enthusiastic about his songs as were Norman Fraser and Gerald Finzi about his concertos. However, he longed for the time and space to write another serious piece "�so anxious to start something long and serious � but summer here is not a good time in this seaside-bedroom-studio of mine for long undisturbed thought." William was very susceptible to his environment but songs and short pieces were all that he could concentrate on during his time in Devonshire. However his output of songs grew day by day. He worked on several Blake songs, The Shepherd, The Echoing Green, Thomas Campion�s, Come, O Come My Life�s Delight. Suddenly publishers were interested "Went to several publishers, Chester & OUP. Mr Gibson would like to take the Laughing Song, Memory Come Hither and Centurion. Mr Norman Peterkin of OUP says that The Shepherd and Echoing Green are two of the best Blake settings he has ever seen. Mr Boosey was interested in the Nicholas Variations and the cello pieces." So after years of trailing his work to publishers and getting little response, they were falling over themselves to publish his work! In May 1944 he travelled up to London where he played and Sinclair Logan sang If Thou Wilt Ease Thine Heart, Centurion, Snowdrop, Memory Hither Come and Laughing Song, at a concert where Lennox Berkeley played his new Viola and Piano Sonatina with Max Rostal. Berkeley liked his songs very much indeed. On the 16th May 1944 at the Maida Vale Studios the London Belgian Piano Quartet recorded the Piano Quartet. This impressed Mr Peterkin of the OUP who said he was very interested in publishing the quartet as well as the cello pieces, Suite for Cello and Piano, Prelude, Capriccio, Nocturne and Tarantella. Gerald Finzi particularly liked the Tarantella. A few days later the BBC recorded ten of his songs, the above group as well as Come, O Come; Bellman; L�Oiseau Bleu; The Soldier and The Promise. Elizabeth Poston became very supportive of William, encouraging him to work which, even though he was producing more good composition, he was finding the grind of war difficult to contend with. The bursts up to London were contrasted with long periods of isolation in Woolacombe. Even though he had his beloved wife and son he missed the companionship of fellow artists, "Although I have been fairly steadily at work, I feel little enthusiasm and am constantly allowing myself to be distracted by war news; anxious thoughts for friends in London (with those horrible flying bombs)." He composed an arrangement and extension of the song The Promise into the cello piece A Memory, which he sent to Elizabeth Poston. In June 1944 he was thrilled to learn that Sheila was pregnant with their long awaited second child. He was then working on a Violin Concerto but being constantly interrupted with visitors fleeing the bombs of London. John Amis and Olive Zorian, violinist; Rudolph Soiron, cellist of the London Belgian Piano Quartet; Nancy Bush and her children, Gerald and Joy Finzi and their children, he loved having all these visitors but it broke the concentration needed for composition. He managed to write a short six-minute piece which he called Lacrimosa for violin and piano. His last visit to London in December 1944 was for a performance of his Cello Concerto by the BBC Concert Orchestra under Raybould, "Raybould and different members of the orchestra; Paul Beard (1st Violin), Gerald Jackson (Flute), Aubrey Brain (1st horn) and others seemed to like it very much�." William Pleeth played the Elegy on the European Service that month also. On December 19th he met Lennox Berkeley who was enthusiastic about his concerto, "�admiring the �skill in orchestration� and letting the cello be heard all the time�" So Lennox, John Amis and Olive Zorian were the last musicians to see him alive. He returned to Woolacombe where he celebrated Christmas with his family. On January 26th 1945 his daughter was born in an Ilfracombe Nursing Home. He was impatient to see his new-born child but while visiting his wife and child all transport was cancelled owing to unusually heavy falls of snow. He had to get back to Nicholas that night so he walked back to Woolacombe along the now impassable cliff path made treacherous by the snow. Exhausted and freezing cold he suffered a severe internal haemorrhage and due to the banks of snow blocking the small roads, no doctor could get through and he tragically died on January 30th 1945. This piece is written by his daughter Julia Cornaby Busch. Voice and Piano: 1930 Slumber Song; 1933 Sweet Content, Harvest Moon, Rest, Weep You No More, The Fairies; 1937 When Thou Did�st Give Thy Love To Me; 1942-3 The Snowdrop in the Wind, The Echoing Green, The Shepherd, If Thou Wilt Ease Thine Heart, Come, O Come My Life�s Delight, The Bellman, The Lowest Trees Hath Tops, L�Oiseau Bleu, Goldfinches, Kitbag, Soldier, There Have Been Happy Days, Promise, Laughing Song, Merry Hither Come.